In 2012, Cathy Bruce, Joan Moss and John Ross conducted a large scale survey about the mathematics teaching practices of kindergarten to grade two teachers. It reveals that educators spend the least amount of instructional time in mathematics on geometric and spatial thinking. This is clearly at odds with the current research on mathematics instruction for Year 1 and Year 2 kindergarten students and puts the students at a significant disadvantage when it comes to their overall education. In a 2016 follow-up to their survey, Bruce and Moss teamed up with Bev Caswell, Tara Flynn and Zachary Hawes to produce the book Taking Shape: Activities to Develop Geometric and Spatial Thinking Grades K – 2. In it, the authors point out that spatial reasoning at age three is a better predictor of general mathematics ability at age five than language is, and that spatial reasoning experiences at an early age are very important in the development of both numerical and problem-solving abilities. A research report in 2009 by the U.S. National Research Council’s (NRC) Committee on Early Childhood Math, titled Mathematics Learning in Early Childhood: Paths Toward Excellence and Equity, provides the definitive argument for spending more instructional time in kindergarten on geometric and spatial skills. The report recommends that mathematics experience and instruction for pre-school and kindergarten children aged three to six years of age concentrate on three topics: number sense and operations, geometry and spatial skills, and measurement. Of these three topics, the primary emphasis should be on number sense and operations and the secondary emphasis on geometry and spatial skill development. Although measurement ideas in these grades are also important, the NRC report advises that it is only necessary to introduce them as broad concepts. Patterning, probability and data management can be woven into work in the first three strands, with only a small investment of class time. recognizing, composing and decomposing stationary geometric shapes and figures. What is the importance of spatial skills and geometry concepts? The 2014 Ontario Ministry of Education monograph, Paying Attention to Spatial Reasoning, makes a powerful argument that spatial skills are extremely important for successful mathematics performance across curriculum strands and for conceptual understanding of numeric quantities, arithmetic, word problems, measurement, geometry, algebra (patterning) and calculus. Brian N. Verdine and three of his colleagues, Roberta Michnick Golinkoff, Kathryn Hirsh-Pasek, and Nora S. Newcombe summarized a large body of research on the topic in their 2014 article “Finding the Missing Piece: Blocks, Puzzles, and Shapes Fuel School Readiness.” They conclude that more sophisticated spatial reasoning improves the quality of children’s early mathematics performance. In one study, the spatial skills of five-year-olds predicted their approximate symbolic calculation skills at age eight, mediated by their linear number line knowledge at age six. The team also determined from research evidence that spatial ability is connected to understanding numeric quantities (i.e., subitizing) and to early numeracy performance. Researchers theorize that children who develop better spatial representations of number earlier than other children may be able to build on this knowledge to learn other numerical concepts, such as number line estimation, magnitude comparison, numeral identification, counting and place value. Spatial thinking also seems to support reasoning in areas which aren’t obviously spatial. In their 2010 article, “Early Education for Spatial Intelligence: Why, What, and How,” published in Mind, Brain, and Education, Nora S. Newcombe and Andrea Frick point out that Venn diagrams can be used to solve logical problems. Graphs, tables and other data displays are tools for thinking which allow children to find patterns and make comparisons. Maps have the capacity to visually show the distribution of variables such as population density or natural and economic resources. Why spend increased time on spatial skills in pre-k and kindergarten? During the past 25 years, educational researchers have confirmed that the period from pre-school (age two) to grade two is an optimum age to improve and expand a child’s spatial skills. In his 2011 article for Science, “Effectiveness of Early Educational Intervention,” W. S. Barnett reports that numerous studies find that preschool intervention in spatial skills instruction is surprisingly effective. Verdane and his three co-authors mentioned earlier, expand on this idea. They quote convincing evidence that spatial skills can be improved with practise, that these improvements endure over time, and that improvements on one type of spatial reasoning task frequently transfer to other types of spatial tasks, even at relatively young ages. In addition, researchers have documented some straightforward but effective play-based, inquiry learning activities which clearly improve spatial skills in young children. Another compelling reason to give priority to spatial reasoning instruction in kindergarten classrooms is that the school setting seems to be an ideal place to practise these skills. In their frequently quoted 1998 study published in Child Development, Janellen Huttenlocher, Susan Levine and Jack Vevea show that children’s spatial abilities grow during the school year but stall during the summer months. Finally, improving spatial skills has also been shown to overcome gender and socio-economic barriers to success in mathematics in school and to gainful employment in the labour force – especially certain careers such as those in science, technology, engineering, art and architecture and mathematics (STEAM) careers. How can spatial reasoning be improved? The research literature indicates that it is relatively straightforward to improve the spatial reasoning abilities of children. It can be accomplished when adults interact with children during their play with spatial toys such as blocks, puzzles, Duplo®, Magna Tiles®, pattern blocks and attribute blocks. They key factor influencing spatial skills development in this case are the spatial words, gestures, questions and challenges that the toys and the play evoke from adults. Temple University researcher Nora Newcombe adds that educators can support young children’s spatial reasoning skills by reading them “spatially challenging picture books.” These are books which examine scenes from various angles or perspectives, include maps and spatial language, or whose illustrations require close attention to decipher their meaning. Some researchers have investigated the use of video programs, video games and tablet and phone apps for the spatial training of young children. In their 2014 article, Verdine, Golinkoff, Hirsh- Pasek and Newcombe urge caution about their use with children aged two to six because of the importance of adult interaction, which is what precipitates the development of spatial language and gestures. What spatial skills deserve the attention of educators? In the classroom, there are two places where pre-school, kindergarten and early grade educator interventions make quantifiable improvements. The first domain is maps and models. According to research by Okamoto, Kotsopoulos, McGarvey and Hallowell, intentional educator interactions have a moderately high ability to improve this spatial skill. The second area which warrants attention from educators is the mental transformation of objects such as rotating, folding, cross-sectioning and deforming. There are two other areas of spatial skill which Okamoto and his colleagues are confident can be improved with training, but further study is needed for proof of this claim. One of them is navigation and perspective taking. This spatial skill includes perspective taking, self-locomotion, spatial language and gesturing, as well as direction, distance and angle in 2D surfaces and 3D environments. The second is training children in 2D shapes (figures) and 3D solid objects. What does a research-based kindergarten mathematics curriculum look like? Some provincial education departments are beginning to recognize the importance of providing spatial and geometric experiences in the early years. In July 2016, the Ontario Ministry of Education published a new kindergarten document, The Kindergarten Program 2016 which is aligned with current research on spatial reasoning in the early years. It states on page 75 that “spatial thinking skills and geometric reasoning play a critical role in the development of problem-solving skills, mathematical learning, and reading comprehension.” The program sets out Ontario’s two-year math curriculum for Year 1 and Year 2 kindergarten students. It lists 28 specific curriculum expectations, five of which are spatial and/or geometric in nature. It also lists eight age-appropriate conceptual understandings for spatial and geometric thinking. Like many provincial curricula, its shortcoming is that it fails to explain in what measure and to what extent these numeracy outcomes should be taught. As every teacher knows, not all curriculum expectations have been created equal. patterning, data management and probability integrated into the first three topics. The point of the above exercise is not to provide an exact formula for teaching mathematics in kindergarten, but to remind educators that not all curriculum expectations are equal, and that emphasizing the need for improving one area of instruction does not mean abandoning another. A group of a dozen kindergarten teachers and early childhood educators from three contiguous district school boards in Ontario have joined forces and taken up the challenge to help our young students improve their spatial and geometric thinking – but within a balanced numeracy program. We have created an open, public knowledge-building and classroom action research wiki at kindergartenspatialreasoning.wikispaces.com/ as a first step. We hope to receive a Teacher Learning and Leadership Program (TLLP) project grant from the Ontario Ministry of Education that will enable us to conduct and disseminate evidence-based classroom research in 2017/18. In the meantime, we are identifying, reviewing and posting useful professional books and articles on our wiki, as well as effective spatial picture books, toys and activities which promote spatial thinking and reasoning and that can be used as provocations to inquiry learning. Elephants Aloft by Kathi Appelt. Illustrated by Keith Baker. (Ages 4 – 7). Rama and Raji, two Indian elephants, travel in a hot-air balloon between mountains, behind waterfalls and across the seas. The author tells the journey of the elephants with positional language and minimal text, which will no doubt prompt a variety of discussions about spatial themes. Big Bug by Henry Cole (Ages 2 – 6). This picture book illustrates that size is relative and is a matter of perspective. The opening two pages feature a ladybug so large it doesn’t quite fit on them, but the next page zooms out to show the ladybug is now small in relation to the leaf on which it sits. The book continues in this vein until the reader arrives at an aerial view of a farm, at which time the comparisons reverse. The minimal text invites children to discuss what they are seeing in each scene. 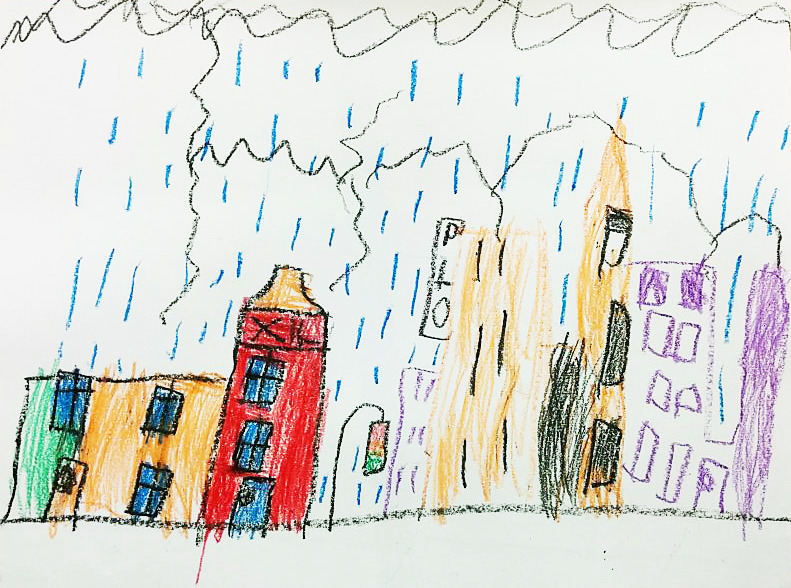 Lucy in the City: A Story About Developing Spatial Skills by Julie Dillemuth (Ages 4 – 8). A lost raccoon named Lucy is trying to find her way home with the help of a kindly owl. Readers follow Lucy’s journey looking down on the city from the owl’s perspective while the owl gives directions. On the journey, the story introduces three fundamental mapping and navigation strategies: interpreting a bird’s eye view map, paying attention to one’s surroundings and retracing one’s steps. The Shape of Things by Dayle Ann Dodds. Illustrated by Julie Lacome. (Ages 3 – 5). This introduction to shapes shows children visually and in verse how circles, squares and triangles are parts of objects that they see every day. The creative team illustrates shapes and objects such as houses and kites with paper collage art. Henry’s Map by David Elliot (Ages 4 – 8). Henry, an extremely organized pig, makes a map of the farm to ensure everything is in the right place. The story introduces readers to the concept of a map as a tool to show where objects are located and also makes the idea of drawing maps. Shrinking Mouse by Pat Hutchins (Ages 2 – 6). Fox, Rabbit, Squirrel, and Mouse notice that their friend Owl gets smaller and smaller as he flies away from them, and they logically and comically conclude that he is shrinking. One by one, the animals set off in pursuit and the same thing happens each time, but they grow bigger when they return. Rosie’s Walk by Pat Hutchins (Ages 2 – 5). This 50-year-old classic story follows a hen named Rosie and a fox stalking her around a barnyard. The text uses directional words to describe Rosie’s journey as she walks around the pond, over the haystack and past the mill, completely oblivious to the fox who is pursuing her and the humorous setbacks he faces on each page. Actual Size by Steve Jenkins (Ages 4 – 8). In this book, Steven Jenkins uses his trademark cut-paper animals and a single line of text to explore the concept of scale. Everything appears at actual size, so while petite critters fit comfortably on the page, larger ones appear as evocatively cropped bits and pieces: a gorilla’s massive hand, a Siberian tiger’s snarling face, and the unnerving, basketball-sized eye of a giant squid. Mouse Shapes by Ellen Stoll Walsh (Ages 4 – 6). Three little mice running from a cat hide among a heap of shapes. Distracted, they make an assortment of pictures from the shapes. For example, they put a triangle on top of a square to create a perfect house. Eventually the mice hatch a clever plan to use the shapes to scare the cat away. When A Line Bends… A Shape Begins by Rhonda Gowler Greene. Illustrated by James Kaczman (Ages 4 – 7). Ten shapes are presented in picture and verse on a double-page spread packed with visual examples. There are even some extras for observant children to discover. It is our hope that you will take advantage of the spatial reasoning picture books listed above as well as the other information and ideas posted on our kindergarten spatial reasoning wiki. We hope our site and this article will help improve numeracy outcomes in our pre-school and kindergarten classrooms as well as yours. Edward Schroeter, B.J., B. Ed., OCT, Reading Specialist, Kindergarten Specialist, Special Education Part 2, FSL-1, Library Resource-1, was trained and worked as a newspaper reporter and documentary video producer. He is a six-time national award-winning playwright and producer of theatre for young audiences. He has taught Core French, French Immersion SK, Grade 3 French Immersion, Grade 4 and kindergarten for the Kawartha Pine Ridge District School Board and the Peterborough County Board of Education, for the past 24 years.